NOTE *1 When the standby mode is set to eco, network functions such as power on over the LAN will not operate. Also, only certain commands can be received for external control using the serial terminal. *2 This value is calculated by continuously turning the lamp on for 2 hours and off for 0.25 hours. The lamp replacement cycle will decrease if the lamp is turned on/off more frequently, or if it is left on for longer intervals. *3 Measurement, measuring conditions and method of notation all comply with ISO 21118 international standards. *5 The operating temperature range is 0°C to 35°C (32°F to 95°F) when used in High- Altitude mode (1,400 m to 2,700 m (4,593 ft to 8,858 ft)). 1 Do not install the projector in locations that are subject to excessive water, humidity, steam or oily smoke. Doing so may result in fire, malfunction or electric shock. 2 The projector uses a high-voltage mercury lamp that contains high internal pressure. This lamp may break, emitting a large sound, or fail to illuminate, due to impact or extended use. When stacking projector units, be sure to provide the amount of space indicated between them. These space requirements also apply to installation where only one projector unit is operating at one time and the other unit is used as a backup. • If the projector is placed in a box or enclosure, the temperature of the air surrounding the projector must be between 0°C (32°F) and 40°C (104°F). Also, make sure the projector’s intake and exhaust openings are not blocked. Take particular care to ensure that hot air from the exhaust openings is not sucked into the intake. 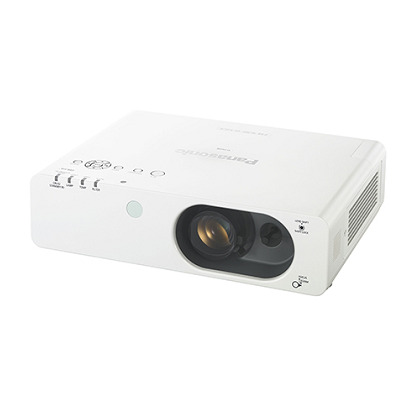 4 The lamp replacement cycle duration becomes shorter if the projector is operated repeatedly for short periods. 5 Due to natural characteristics of lamps, screen brightness may vary (flicker). This is not an indication of faulty lamp performance.